A bumper issue! Lots of interesting stuff to read this week. I sometimes have things I would like to share with people interested in the web platform that don't really fit within the CSS Layout category, and I don't want to off-topic this list. So I've set up a more general, occasional email list which you can sign up for on my blog if interested. That won't be a weekly thing, just a way for me to keep in touch with people who are interested in the things I'm doing for CSS and beyond. The email this week is sponsored by An Event Apart. I'm speaking at all of the events this year, along with an amazing lineup of speakers. I hope to see you there! A post about the new Flexbox Inspector for Firefox DevTools. It's already in DevEdition and Nightly, and will be in the Firefox 65 release on January 29th. If you have Firefox Nightly then you can see animation for Grid Tracks working. Gaps can also be animated. This pen also links to the issue for Google Chrome, star the issue to show your support for implementation. As co-editor of the spec, it seems remiss of me not to have written an article for Smashing about it. Find out about the possible use cases for multicol. Nice article about CSS Subgrid, I really cannot wait until we have implementations to play with. The various approaches for a Masonry style layout, collected together by Chris Coyier. A thorough article about Web Standards for Smashing Magazine from Amy Dickens. A useful post explaining what CSS Containment is, and the work Igalia has been doing implementing it in Chromium. In this article Cathy Dutton notes how modern CSS has enabled her to move away from Sass. I think the key thing here is how much simpler CSS can be today, due to the new things we have. People often think that all these new features means it is more complex, but it so many ways it is more straightforward. 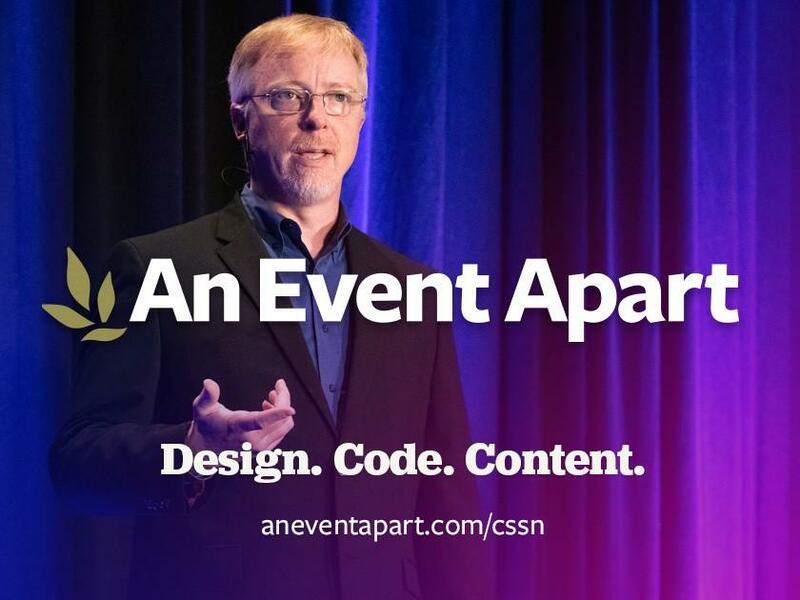 Announcing An Event Apart ... apart! You told us you love our Special Edition conferences, featuring 3 days of great speakers—17 of them, 5 more than our traditional events. We heard you! That’s why in 2019, every AEA conference is a special edition … and 17-speaker extravaganzas are how we roll. Take home hands-on, hard-won lessons and insights taught by front-end and UX leaders like Rachel Andrew, Jen Simmons, Brad Frost, Val Head, Dan Mall, Sarah Drasner, Trent Walton, Sarah Parmenter, Mina Markham, Chris Coyier, Sara Soueidan, Derek Featherstone, Aaron Gustafson, Aarron Walter, Dave Rupert, Gerry McGovern, Kate O’Neill, Laura Martini, Luke Wroblewski, Scott Jehl, Una Kravets, Margot Bloomstein, Jason Grigsby, Eric Meyer, Jeffrey Zeldman, and many more! Learn the latest on all the trends affecting your work, from the pioneers who created them. And at AEA, you don’t just learn from the best, you can also interact with them. So be part of our best year yet! CSS Layout News fans save $100 off any two or three days with code AEACSSN.